Fr Rufus Pereira was a great minister and gift of God to the Roman Catholic Church. He grew up in Mumbai, India and served most of the his priest hood years from the Diocesan Pastoral Centre in Bandra, Mumbai, India.. He was a parish priest at St Pius Church at Mulund in Mumbai, India. He was an evangelist and brought the Gospel to many souls. He was blessed with a ministry of Healing and Deliverance.A very specialized ministry. He helped several people oppressed and possessed by evil spirits to be healed of their afflictions and even those people with physical ailments. Fr Rufus worked hard and gave his life for the spreading the Charismatic Renewal in India and all over the world since 1972. He worked tirelessly in many nations giving conferences on healing and deliverance ministry. He was known worldwide for his ministry of exorcism, he was vice president of the International Association of Exorcists and started the International Association for the deliverance ministry… He was the editor for several magazines in India which included the national Charis India. He wrote for Dubai's website:- Holy Spirit Interactive and several other editorial blogs. Fr Rufus came to Cardiff in September 2009 and give a conference to Leaders and the people of Wales.. The people of Wales remember him for the spiritual gifts he showered on them that year. 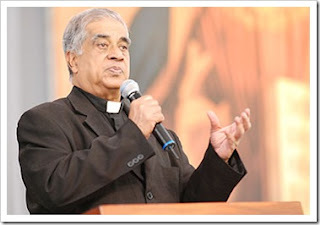 Sadly in the early hours of 2nd May 2012, Fr Rufus Pereira went into Cardiac arrest and died in his residence in London, England. The coroner examined the cause of his death and said it was a heart failure due to blockage in the valve of the heart. Before Funeral mass in London and the day after the mass before travel to India. Fr Rufus's body was stored for two weeks after his death at the Chapel of Rest, 14 Watford Way, Hendon, London NW4 3AD. The British community people paid their last tribute to him.. The mass in the UK was attended by atleast 70-100 people which included Fr Rufus Pereira's family; His sister in law, Niece and Nephew. Erika Gibello and her family and by leaders in renewal. The members of International Charismatic Renewal (ICCRS) was seen which was Michelle Moran, Ex President of ICCRS; Charles Whitehead and his wife Sue Whitehead. Some members from Diocesan Service Team of Cardiff also attended the funeral mass. The mass celebrated by an Italian priests and few members from Europe flew in to attend the funeral mass. His body was flown to India on 17th May 2012 for burial and was accompanied by his family and friend Erika Gibello. A procession from his family home, 24 New Kantwadi, Bandra West, Mumbai- 40o050, India to St Andrews church ground as planned earlier did not take place at about 2pm instead the body was placed at 2pm on the ancestral family ground for public viewing at St. Andrews High School’s sprawling grounds. His remains were exposed to the public as per Indian tradition. The multitude of crowds who gathered there were estimated to 3,000 plus. A much larger crowd compared to the UK. The crowds gathered in large numbers to pay their tribute and have the last view and glimpse of their one of the most revered priests ever. The Funeral Mass was celebrated by CARDINAL OSWALD GRACIAS, with four BISHOPS as con-celebrants, amongst many a priests who distributed The Holy Eucharist. Mass and Burial was held on 19th May at 4pm, St Andrews school Ground, Hill Road, Bandra, Mumbai, 400050 India. During the mass Cardinal Oswald Gracias placed a chalice in Fr Rufus's hands. You can view photos of this event on our website. The burial was attended by the family members only at the nearby St. Andrews Church Cemetery, owing to the fear of stampede and traffic jam considering the overwhelmingly huge presence of the mourners and bereaved relatives and friends gathered under a gigantic tent or a marquee which over shadowed the scorching heat of the Sun. Fritz, Alison, Bradley, Nedra, Simone & Sean." The people of Wales will miss Fr Rufus Pereira dearly and we pray that his soul rest in the loving arms of Jesus and our dear Mother Mary.